Until recently, beer drinkers in France who wanted to quaff anything with character had to be content with a limited number of foreign-made beers, mostly from Belgium. The Belgian brewing tradition is long and revered, featuring a wealth of brews in traditional styles. But as devotees of craft beer know, there is more to beer than simple tradition. Microbrewers in the US and UK have been bucking tradition for decades now, and in doing so have revitalized an industry and gained legions of passionate customers. In more recent years, while craft beers have taken off in neighboring countries like Denmark and Italy, France has lagged behind, content with its industrially-made Kronenbourg. That’s all changing. It seems that in Paris, craft beer has finally arrived. Strictly defined, a craft beer is one made by a small brewery – in the United States this means one that produces less 6 million or fewer barrels per year – with the majority of beers being brewed with 100% barley malt. An American craft brewery must also be independent, meaning that at least 75% of it is owned or financially controlled by non-corporate interests. France lacks a specific definition of craft beer, but its ‘bière artisanale’ category covers a wide range of models, including Trappist ales, regional beers, and microbrews. Despite differences in legal definitions, craft brewers the world over share traits of innovation. Working from a base of respect for traditional styles, they reformulate classic recipes with unique twists or even create new styles using conventional ingredients or techniques. The craft brewing trend that took hold in England and the United States in the 1970s and ’80s has taken much longer to arrive in France, but beer itself is not a foreign concept. In addition to the deeply ingrained wine culture of France, regions like Brittany, Alsace, and the Nord-Pas de Calais (near the Belgian border) all have longstanding brewing traditions, and France’s brewery-beer halls (the word ‘brasserie’ actually means brewery) were very popular places to eat, drink, and dance in Paris in the first half of the twentieth century. Companies such as Gallia and Demory, revivals of defunct Parisian beer brands, are looking to bring this culture back. “Many people didn’t know that beer could be more than the industrial stuff poured in cafés, says Jonathan Kron, co-founder of Demory. “When they find out that small, tasteful beers exist, they prefer that.” Delorme concurs: “People are drinking less, but better. Once they try a beer with real flavor, they don’t want to go back.” In fact, according to Kron, “Industrial beer sales are declining in France, while sales of artisanal beers are increasing.” Given this preference among Parisian consumers of quality over quantity, and the increasing desire to consume local, non-industrial products, craft beer is primed for a boom. “It’s changing very fast in Paris – we’re catching up to cities like Rome and Copenhagen, and in five years Paris will be one of the top beer cities in Europe.” predicts Simon Thillou, who founded Paris’ second-oldest beer shop, La Cave à Bulles, and is cited by his peers as a major instigator of the current beer revolution in Paris. “If Simon hadn’t been there, we probably wouldn’t be selling French craft beer,” says Claudia Lerin-Falliero, co-founder of Le Supercoin. 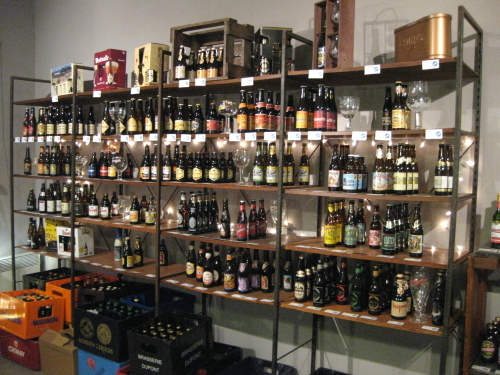 The availability of good beer in Paris has expanded from a reasonable selection of Belgians to include a rapidly growing set of craft beers from smaller producers in the UK, the Netherlands, Denmark, France, and even the USA. While bars like Académie de la Bière and Falstaff continue to delight patrons with their libraries of Trappist and Abbey beers, there is a wave of newer bars where serious beer lovers can go to get their craft brew fix from a wider geographic palette. The stars of this burgeoning scene include Express de Lyon, an otherwise nondescript PMU bar that just happens to pour tasty beers from the likes of Craig Allan, Mikkeller, and BrewDog; Le SuperCoin, whose all-French beer lineup is impressive not only in its diversity but also in its low prices and lack of pretense (“It’s not Sartre, it’s beer,” quips Lerin-Falliero); and La Fine Mousse, where the pain of paying 7€ for a demi is tempered by the fact that you’re unlikely to find this beer on tap anywhere else. 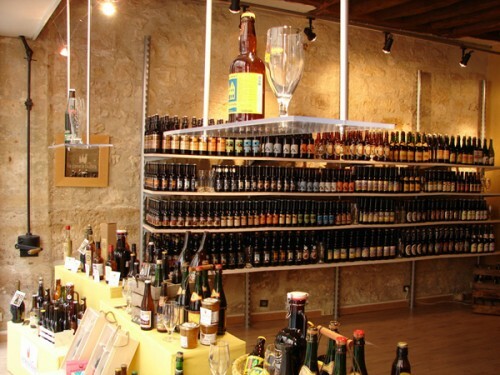 For those who prefer to do their beer-drinking on the couch at home, Paris has a few excellent beer shops, with more popping up all the time. La Cave à Bulles is the mothership for people seeking French craft brews, where Thillou (who was also instrumental in opening La Fine Mousse) has helped many a beer-lover find a new favorite among his collection. Bootlegger is a favorite for affordable bottles, and newcomer La Moustache Blanche appeals for its cool vibe, central location, and manifest enthusiasm for all the good beers of the world. Defying categorization, Brewberry, Bière et Malt, and Brasserie de la Goutte d’Or add more ways to buy and consume craft beer in Paris. Brewberry stocks hundreds of beers for purchase, and keeps a smaller selection chilled for on-site drinking. 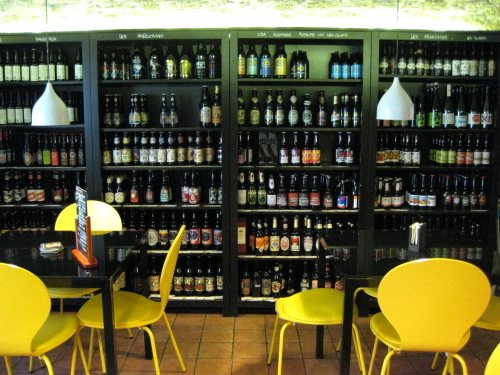 Bière et Malt has a similar setup, and though there are not as many beers to choose from, all are stocked cold for immediate consumption at one of the shop’s four tables. At Brasserie de la Goutte d’Or, the first actual brewery within Paris for many decades, informal tastings are offered a few evenings a week and bottles can be purchased to go for very reasonable prices. Inspired by the predominantly African neighborhood where it’s located, their four beers are brewed using exotic ingredients such as dates, allspice, rooibos, and cola nuts. The current contingent of French craft beers is characterized by a trend towards dry-hopping and enthusiasm for going beyond the boundaries of traditional French beer categories. Craig Allan, a Scotsman who lives in France and brews in Belgium (but hopes to move production to France this year), makes the rightfully popular Agent Provocateur, a medium-bodied beer with a floral-citrus hop character. It has more in common with an American IPA than a French ambrée. In the tradition of German rauchbier, beers made with smoked malt are gaining in popularity as well – both Brasserie de la Goutte d’Or and My Beer Company (a brewery just Northeast of Paris in Levallois-Perret) are selling them. While French brewers are clearly inspired by craft brews from around the world, they maintain a certain subtlety and refinement of flavor that, when you think about it, is perfectly French. Combine these with the assertive, hop-forward beers from UK breweries like BrewDog and Magic Rock and the beer-geek declensions of hops, malts, and yeasts by Danish cult favorite Mikkeller, and Paris’ emergent beer scene is looking fresh, dynamic, and inclusive. The idea of pairing craft beer with food has been a little slower to catch on. As most restaurateurs don’t have time to track down individual breweries, they’re limited by what the major distributors are offering. In addition, diners in French restaurants are expecting wine. “The French culture of gastronomy is very conservative – people are shocked when you suggest that a beer goes with foie gras,” says Thillou. The French wine industry encourages the idea that only wine can accompany a fine meal, happy to keep beer in its place as a working-class beverage. “There is a certain snobbery which persists and for some people beer cannot be taken as seriously as wine, ” says Allan. “This is true in other countries but is fairly pronounced in France.” Lerin-Falliero is optimistic that this new movement will attract a wider audience of French drinkers to beer. “I hope craft brewing will extend the beer culture to more cultivated tastes while still remaining a drink of the people,” she says. 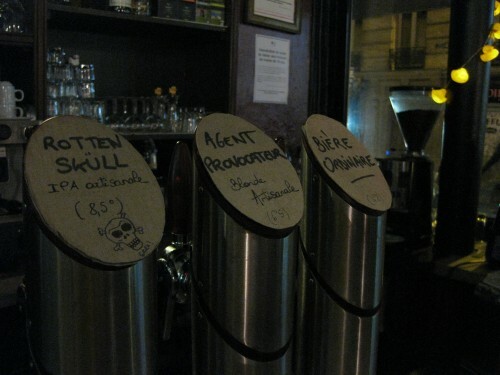 There is a new awesone beer bar in Paris. I think you would like it so much. 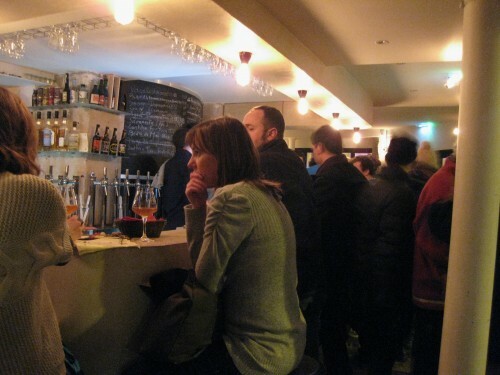 That called “Les Trois 8” and it already is in our Top 10 of French beer bars. You have to go there. Thank you for this! 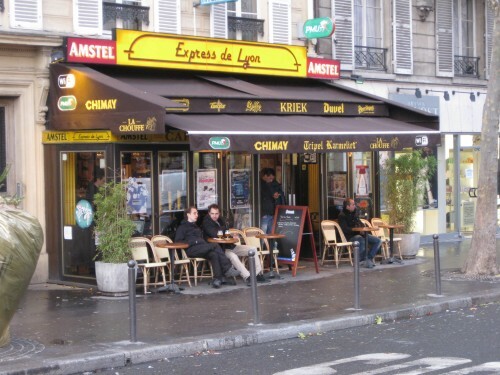 Will be visiting Paris again in April (haven’t been since 2005) so I’m anxious to check out the craft beer scene now. Cheers! I am so thrilled to hear craft beer is taking off in Paris! I have been meaning to visit and now have yet another reason to. Great article! Thank you!